Apple's massive campus expansion in Cupertino, Calif., is making rapid progress, as revealed in aerial shots captured by an amateur photographer using a DJI Phantom 2 Vision+ drone sponsored by B&H Photo Video. 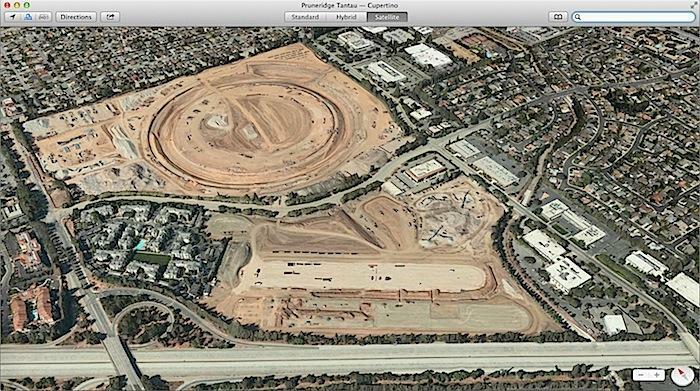 The latest footage of the Campus 2 site, exclusively captured by a DJI Phantom 2 Vision+ drone, reveals massive initial earthwork and the beginning concrete foundations of the circular Campus 2 structure making up the center of the site, as well as two large parking structures south of the central "spaceship," straddling Interstate 280. Once completed, the ring will provide over 2.8 million square feet of space and house over 12,000 employees. In the video above, the B&H drone rises at the northwest corner of the construction site, flies over the ring foundation, and then turns around to view the concrete plant inside the green perimeter fence that circles the site. In the image above, the northwest corner of the construction site has been devoted to earthwork, following the removal of acres of parking lots that formerly covered most of the site. After the construction work is finished, these piles of sand, cement and gravel will be replaced with fruiting orchards surround by other trees. The space is also slated to include a fitness center for employees. A subterranean ring foundation and retaining walls are also now taking shape, visible in the detail above. The initial walls appear to be rising about four stories above the basement, dwarfing the large concrete mixers and pumper trucks currently working to rapidly lay slabs that will make up the floor of the giant ring-shaped building. Viewing the Campus 2 site from the opposite south edge (below), you can see that all of Ridgeview Court and most of Pruneridge Avenue are now gone. A detail of the image (below) illustrates the scale of the earthwork being performed, which dwarfs the existing building on the remaining stump of Pruneridge Ave at the central eastern edge of the site. 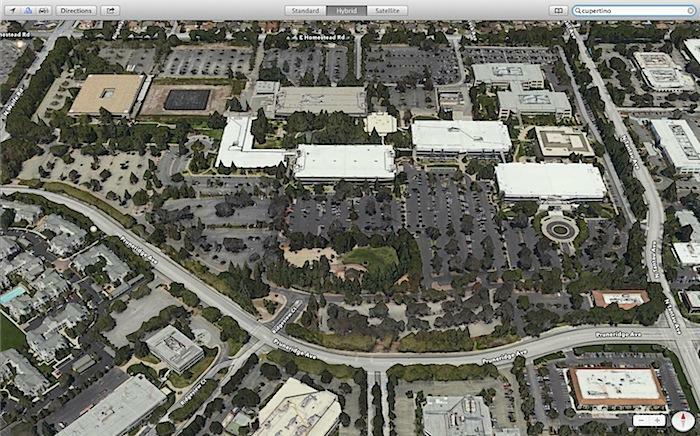 Apple had been actively using a series of other low rise office buildings on Ridgeview, located between the apartment complex on the west edge of the site and the eastern boundary defined by Tantau Ave and the concrete waterway that cuts through the southeast corner of the parcel. The series of six Ridgeview buildings, previously profiled in our report early last year, are now all gone. In their place, two long oval foundations are being installed for the twin parking structures that will go up along the freeway, providing most of the 9,240 parking spaces planned for the site. A short segment of Pruneridge Avenue will remain to serve as the access path for cars parking in these new structures from Wolfe Road on the western boundary (as well as serving the apartment complex that encroaches on the site). In the video below, the B&H drone rises at the south 280 freeway edge of the construction site and flies over the parking structure foundations toward the central ring. Apple also has aggressive plans to leverage its existing transit program to divert as much commuter traffic as possible into its own shuttle busses, which integrate with regional transit systems. The company outlined commitments last summer to move 34 percent of the 14,200 employees who will work at Campus 2 out of single occupancy vehicles. AppleInsider reviewed the DJI Phantom 2 Vision+ flying drone last month and found the stabilized camera to be a huge improvement over its predecessor. The device can be purchased here from partner and authorized reseller B&H Photo. 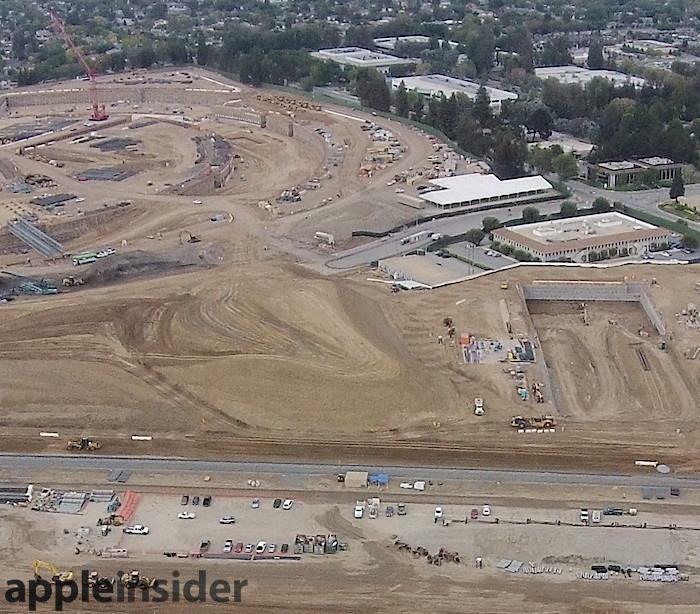 Apple itself has publicly portrayed its Campus 2 construction project in its interactive 3D Flyover images (below) presented by Apple Maps for iOS and OS X, although the latest imagey appears to be from around June of this year. Apple has updated its Maps Flyover imagery of the site since April, when it depicted the site as it appeared last year (below), with all of the original buildings of the former Hewlett Packard Pruneridge site occupying the top half of the parcel, in the land between Pruneridge Avenue and the northern boundary of East Homestead Road. Apple's current Flyover imagery is more up to date than Google Earth, which hasn't been updated in years, or Google Maps satellite images, which still portrays the former site with only some demolition of buildings evident. 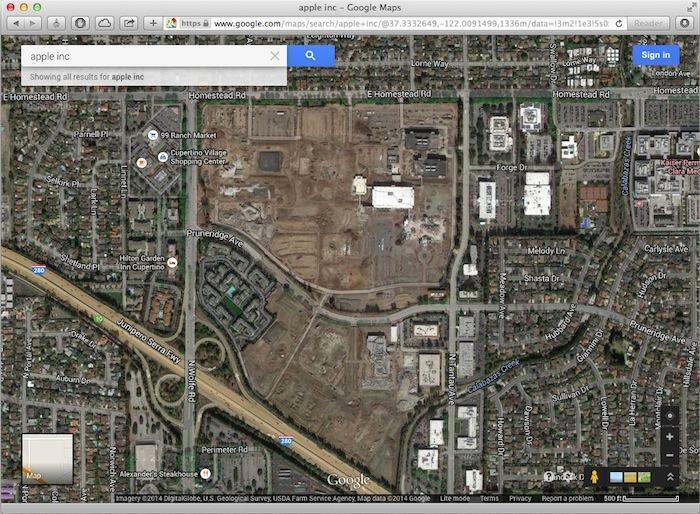 Apple began demolishing the old HP buildings over the past winter.